How do Japanese women stay so slim? If I ask my Japanese girl friends about their hobbies, most will say "sweets" (if you ask the average guy, he'll probably say 'drinking' or 'sleeping'). Luckily, Ogawaken Raisinwich cookies are not so easy to get, so those stylish girls can stay svelte. I was first introduced to this style of snack - juicy, rum-soaked raisins in cream, sandwiched between buttery cookies - when my friend Makoto would bring back boxes of Hokkaido's famous Marusei Butter Sando by Rokkatei, on his regular trips to Hakodate. Sadly, he changed jobs and the omiyage supply dried up. 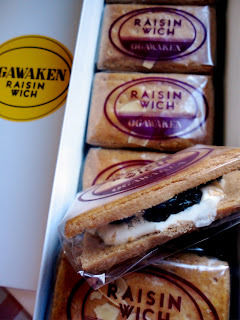 But then, thanks to an acquaintance, I discovered Ogawaken Raisinwich last year. I think the Marusei Butter Sando is a little richer and more buttery... but I haven't been able to get them both at the same time to do a taste-test! 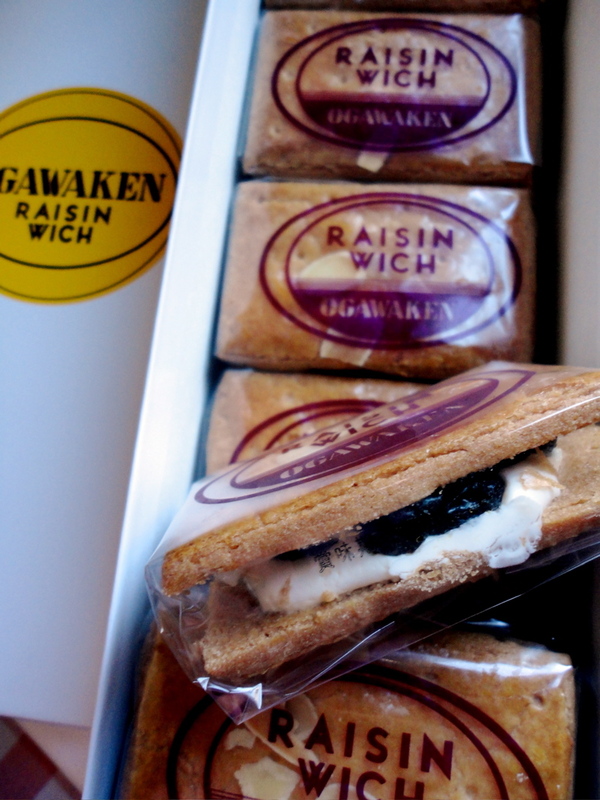 According to the Japanese version of Wikipedia, Rokkatei's version was developed in 1977, when the Ogawaken Raisinwich was already very popular, but expensive. 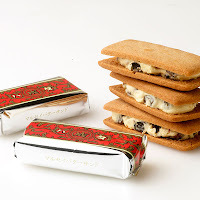 Rokkatei incorporated butter and white chocolate into the filling, which explains the heavier, richer taste. 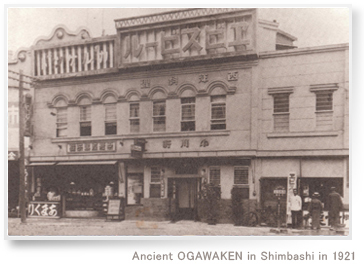 Ogawaken started in 1905 as a western-style restaurant in Shimbashi. It's now a very popular patisserie, with another branch in Meguro. The Raisinwich was apparently invented about 40 years ago. They're very popular and only available at their two shops, so they often sell out by the late afternoon. 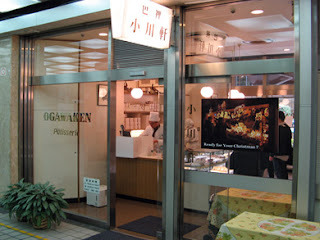 The Shimbashi store is also a bit tricky to find, being hidden around the back of the Shimbashi Ekimae building. However, they recently updated their website in English with good maps! The cookies are crunchy and light, topped with flaked almonds. The raisins are very juicy and have a nice little rum kick. Apparently the raisins are from California and the butter is from Hokkaido. Because they're made with fresh cream and butter, they only keep for a week or less, but you'll have no trouble eating them quickly! I love the simple, graphic packaging, and of course, the taste. Here's the website. Now I really want to do a taste comparison!